ThirtyFifty has a range of wine tastings, beer tastings, gin tastings and whisky tastings for corporate entertainment and internal team or company events. Whether its to say thank you to clients or celebrate success with your team, our experienced and engaging hosts will put your guests at ease and ensure a good time is had. Our wine tasting challenges are always highly interactive and good fun, pitched at just the right level for your event, whether it be a small group of discerning wine buffs or a larger audience of enthusiastic drinkers. We turn wine education into entertainment so that your guests leave with much greater confidence when tackling a wine list. For wine tasting ideas to entertain clients or colleagues look at our tastings at a glance section - at the top level for pure entertainment the Interactive Wine Tasting Show or Fine Wine Challenge may fit the bill. For a fun 1-2 hour tasting session with quiz challenges we have a range of Corporate Wine Tasting Packages. 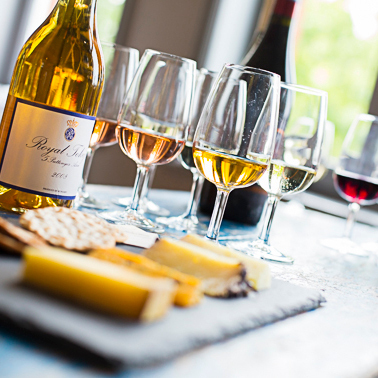 If you're looking for a walkabout format where guests can mingle we can host a Network Tasting. If you have other corporate hospitality objectives not covered by our existing formats, please ask and we will do our very best to accommodate you. Tastings can be held for groups of 10 to 100+ at any time of the day or evening - at your offices or an off-site venue. Contact us on 0208 288 0314 or by email to obtain a quote or to make a booking. I would just like to thank you for a fantastic evening at Prism. The event was very professionally run and all our guests were impressed with the quality of the wines and the knowledge on them! I look forward to working with you again in the future.